On Friday, Tracey and I travelled down to BrightonSEO on the train with a very early start leaving Birmingham International and Rugby in the dark! Bumping into a familiar face at London and then arriving at Brighton Station, I soon realised the popularity of the conference. I even turned off Google Maps after finding a much simpler tactic of following the crowd of “hoodies and backpacks” which led us to a long queue of excited folks taking photos on smart phones. 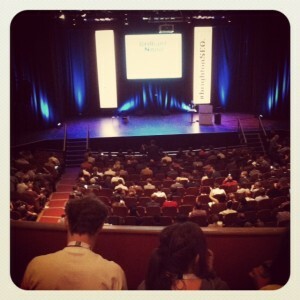 First speaker Dave Trott kicked off the day with a fantastic presentation on ‘Predatory Thinking’. Personally my favourite talk of the day, many of his words have stuck in my head and I even found myself repeating his examples the next day in a beer garden! Using theories and stories that would interest many industries, he emphasized the importance of being different in our SEO efforts in order to be successful, pointing out that 90% of adverts often go unnoticed. The rest of the talks in the morning session were mainly focussed on users and content, with talks by Anthony Mayfield of Brilliant Noise, Stephanie Troeth and Martin Belam of Emblem. Becky Weeks gave a different and insightful rundown of a trial that MGOMD ran with a client campaign called “Chasing the Algorithm”. Good to hear an honest overview of the (naughty) type of link building they did, how they got hit by Google updates and how they tried to combat it. In the end, Becky gave the conclusion that they wouldn’t advise using those tactics again as they feel a future-proof strategy will be much more worthwhile in gaining long-term results. Hope everyone was listening… Will Critchlow from Distilled also made an appearance to fill in for his colleague Tom Anthony, who had prepared some slides titled ‘API? WTF?’ Tom’s slides expressed his thoughts on the future of search and how results are returned to users such as the weather forecasts, hotel availabilities and credit card comparisons being shown in Google itself. Will left us with food for thought after suggesting that the way we access the web will change and so will the way we search – giving an example of Google glasses. After lunch, we unexpectedly found ourselves in the Red Button Room after the guys at the Analytics SEO stand mentioned that Nick Garner, Head of Search at Unibet, was speaking about how he saved thousands of pounds on link building. I’ve posted an overview of his presentation here as I took a lot of notes and realise that the majority of people were in the main auditorium. We returned to the main room in time to hear Lynne Murphy’s very interesting presentation on linguistics, giving us a history lesson on the English language and the Americanisms. There was a lot of positive feedback on Lynne’s talk as she managed to get quite a few laughs. We really enjoyed the afternoon session where each speaker had 7 minutes to present their slides. Topics included mobile SEO, content strategies, competitor research, link building, Pinterest and analytics which were covered well by speakers Aleyda Solis of Orainti Search Marketing, Simon Penson of Zazzle Media, Yousef Sekander of Rocket Mill, Berian Reed of AutoTrader, Sion O’Connor of Vanquis Bank, Danielle Fudge of Forward3D, Tom Lewis of DC Storm and Anna Lewis of Koozai. Jason Woodford, CEO of SiteVisibility, spoke at the near end of the conference with ‘reasons to be cheerful’ about the SEO industry (SEO is booming!) and suggested that we take responsibility for nurturing the industry by helping to improve the skills shortages with a scheme of work placements. Unfortunately we had to leave the Brighton Dome when the party was getting started – although we did manage to use our free drink tokens to sample the ale on offer in the event’s own beer festival. A special mention to Dan Bell who provided Tracey with a ticket to go! 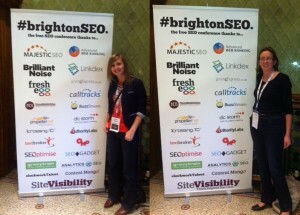 It was great to meet up with fellow SEOs (even those who were also lost in the tube station!) on the way home!) and we hope to keep in touch through Twitter on our own accounts @hanskapde and @TFletcherSEO as well as our agency account @HeadRedMedia. 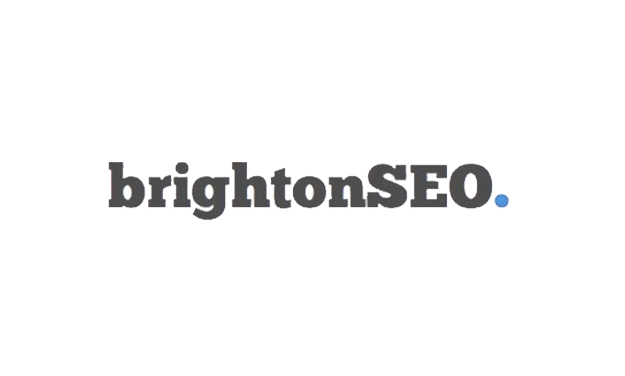 We will be publishing more posts on the things we learned at BrightonSEO so keep your eyes peeled!